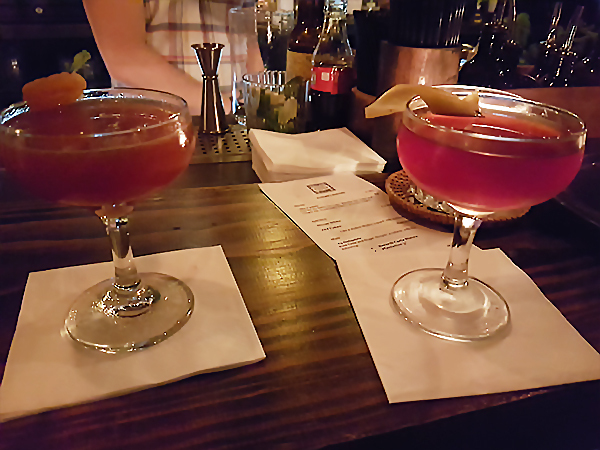 We were kindly invited to Burlock at the end of last year, making a rather welcome diversion from the long days of house renovations taking up most of our free time. Burlock is a bar that specialises in rum, located very centrally in London, just off Oxford Street. It’s a basement location, so they capitalise on that with dim lighting and candles to set the atmosphere. Early on Saturday evening there was a modest number of other punters out for a quiet drink to end a day of shopping; but the party crowd came later, when the DJ takes to the decks. 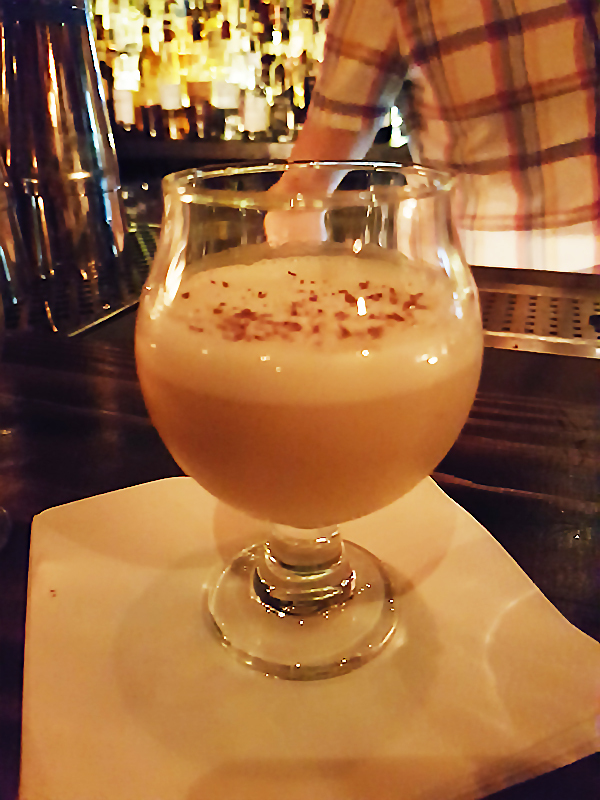 To kick off we had a Thousandaire – Doorly’s 3 year, cherry brandy, apricot, lime and a dash of absinthe – and a Rum-ember the Maine – Mezan XO, cherry brandy, Martini Rosso, IPA beer, Cornish pastis and an ember garnish. 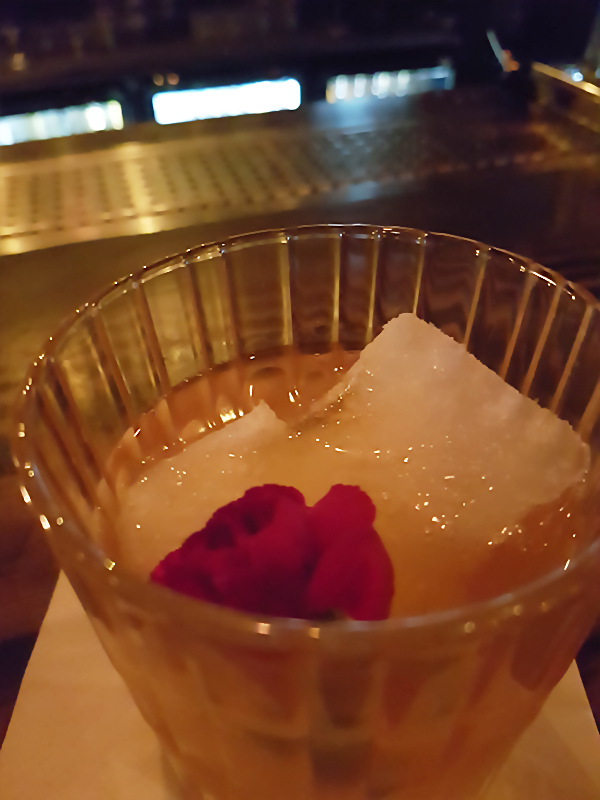 It soon became clear that the bar staff know their rum, and take their time to mix and present the drink – where you don’t mind waiting to watch it all. 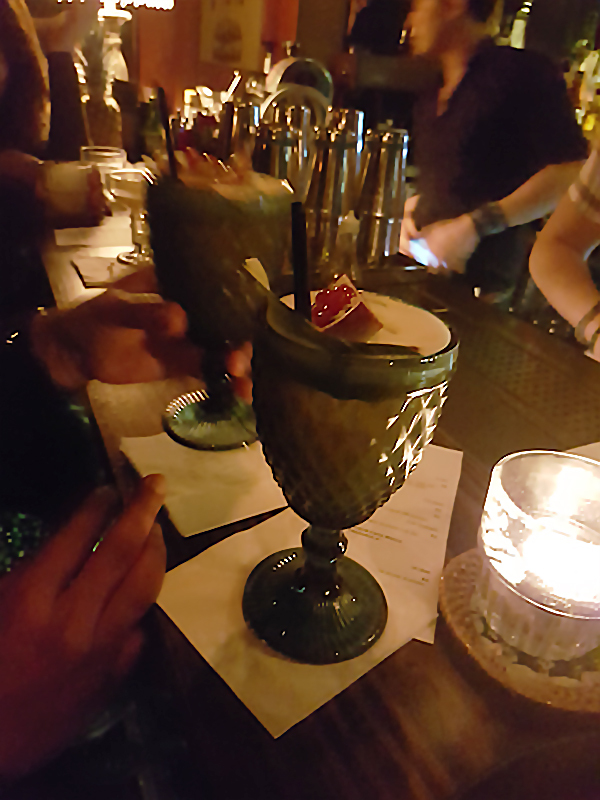 Next up was a couple of Hurricanes, with Bacardi Carta Blanca, Pusser’s Gunpowder proof, pineapple, lime and homemade passionfruit cordial, presented in these pineapple-esque goblets. Barman Timmy wanted to show us a tip he’d picked up from his travels with the next one that we shared: Off the Hook. It’s Mount Gay Black Barrel, Lillet Blanc, Mandarin Napoleon and bitters, served with a huge coconut water ice cube that melted down to add a tropical note. Definitely something we’re going to try at home. To end was the dessert-style Grasshopper Deluxe. As someone who is not the world’s biggest fan of creamy drinks, I wasn’t sure so we just ordered one. Along with the usual base for the Grasshopper (chocolate liqueur, crème de menthe and cream) was Plantation Original Dark. First up I was pleased they used a clear crème de menthe, so it didn’t have the offputting green creaminess of a traditional Grasshopper and taste-wise, I was actually surprised that I found myself liking it: cool and minty rather than creamy and cloying. You’d only have one though. We also sampled some of their bar snacks, which include the sure-fire favourite of pao de queijo (cheesy bread balls) and jerk spiced fried chicken. The menu comprises several internationally inspired bites to accompany the worldwide listing of rums. We were there for a couple of hours, but you could easily spend all night there, taking advantage of the never-ending happy hour that sees special offers on certain drinks over hourly slots. Big thanks to Sam, Timmy and the rest of the bar staff for looking after us! Until next time, keep rumming!